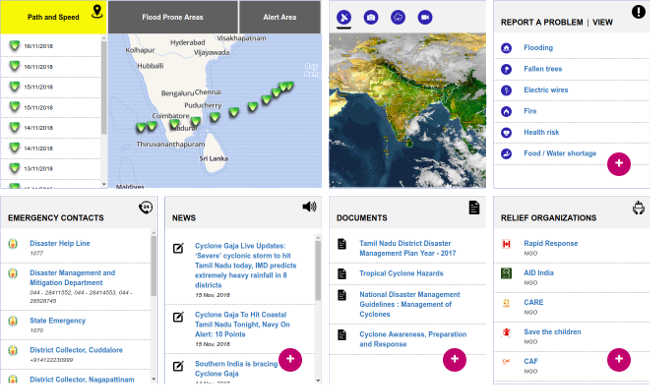 Mapunity's resilience platform is a rapidly deployable set of tools that can help people and governments respond to a crisis, and also an educational platform for preparedness before crises materialise. It covers a wide range of serious events to which governments and citizens need to be resilient - storms, earthquakes, chemical and nuclear spills, terror attacks, and major fires. The platform is collaborative and works from the ground up. Anyone can start one for their city, and keep adding features and capabilities to it. And the best part is, whatever new tools are created for one city become instantly available for all. Browse videos and text that provide guidance on how to prepare for disasters, and what to do / avoid during one. Know which areas are impacted by disasters, and likely risks to people and property. Report damages and injuries caused by events, to facilitate response and assistance. Get in touch with rapid response teams through helplines, email IDs or social media addresses. Keep in touch with the latest information about events. Here is a list of organizations that are helping with relief efforts. Upload documents that help people understand policies and responses to disasters.